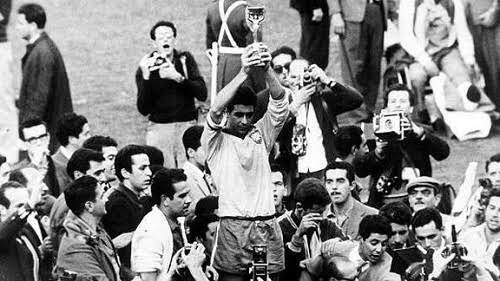 The 1962 FIFA World Cup was the 7th FIFA World Cup and It was held from 30 May to 17 June 1962 in Chile. Fourteen teams qualified from this process, along with the host nation Chile and defending champion Brazil, for the finals tournament. In May 1960, as the preparations were well under way, Chile suffered the largest earthquake ever recorded (9.5 magnitude), which caused enormous damage to the national infrastructure. In the face of this, Carlos Dittborn, the president of the Organization Committee, coined the phrase “Because we don’t have anything, we will do everything in our power to rebuild”. Stadia and other infrastructure were rebuilt at record speed and the tournament occurred on schedule with no major organizational flaw. Dittborn did not live to see the success of his efforts, as he died one month before the start of the tournament. The World Cup venue at Arica was named Estadio Carlos Dittborn in his honour and bears his name to this day. Even with these few and low-capacity stadiums Chile was able to meet the demand for seats as international travel to Chile, far-away for Europe, was minimal at the time. President Jorge Alessandri gave an uninspiring inaugural speech before the first match, which was played between Chile and Switzerland. Alessandri left however before the end of the match. While Chilean society was living in a “footballized” atmosphere, Alessandri was criticized for his cold attitude towards the tournament, which forced his ministers to come out and claim he was as “footballized” as everybody else, but was too busy to devote too much attention to the competition. The competition was marred by constant violence on the pitch. This poisonous atmosphere culminated in the infamous first-round match between host Chile and Italy (2–0), known as the Battle of Santiago. Two Italian journalists had written unflattering articles about the host country and its capital city; describing Santiago as a “proudly backwards and poverty-stricken dump full of prostitution and crime”. Although only two players (both of them Italian) were sent off by the English referee Ken Aston, the match saw repeated attempts from players on both sides to harm opponents, and the Italian team needed police protection to leave the field in safety. Articles in the Italian papers La Nazione and Corriere della Sera were saying that allowing Chile to host the World Cup was “pure madness”; this was used and magnified by local newspapers to inflame the Chilean population. The British newspaper the Daily Express wrote “The tournament shows every sign of developing into a violent bloodbath. Reports read like battlefront dispatches; the Italy vs West Germany match was described as ‘wrestling and warfare'”. Pele was injured in the second group match against Czechoslovakia. The USSR’s goalkeeper Lev Yashi, arguably the world’s best at the time, was in poor form and his team went out to Chile (1–2) in the quarter-finals. 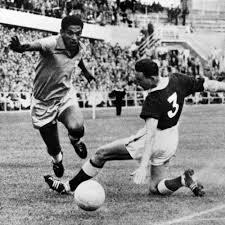 Bright spots included the emergence of the young Brazilians Amarido (standing in for Pelé) and Garrincha, the heroics of Czechoslovakia goalkeeper Viliam Schrojf against Hungary andYugoslavia, and the performance of the host nation Chile, who took third place with a squad of relatively unknown players. Chile defeated European champions USSR to earn a semi-final game against the winner of the England – Brazil game. Garrincha scored two goals in a 3–1 win against England. Meanwhile, 1–0 wins for Yugoslavia against West Germany – and another 1–0 win of Czechoslovakia against neighbors Hungary – saw the two Slavic states meet in the semi-finals. Vina del Mar was the original venue for the South American semi-final and Santiago for the Slavic one, but due to Chile’s surprise qualification, the organizers prompted FIFA to switch the venues. These irritated crowds in Viña del Mar and only a little fewer than 6,000 spectators came to Estadio Sausalito to watch Czechoslovakia beat Yugoslavia 3–1, whereas a capacity crowd of 76,600 in Santiago watched Brazil beat the hosts 4–2.This game saw Garrincha sent off for Brazil and Honorino Honorino Landa sent off for Chile. Chile eventually took third place in a 1–0 victory over Yugoslavia with the very last play of the match. The same player, Eladio Rojos, had also scored the winning goal in Chile’s game against USSR. Santiagos Estadio Nacional served as the venue for the final, and after 15 minutes, Brazil again found themselves a goal behind in the World Cup final, as a long ball from Adolf Scherer was latched onto by Josef Masoput: 1–0 Czechoslovakia. As in the previous final in 1958, Brazil soon hit back, equalising two minutes later through Amarildo after an error by Czechoslovak goalkeeper Schroijf. The Brazilians scored goals from Zito and Vava (another Schrojf error) midway through the second half, and the Czechoslovaks could not get back into the game. 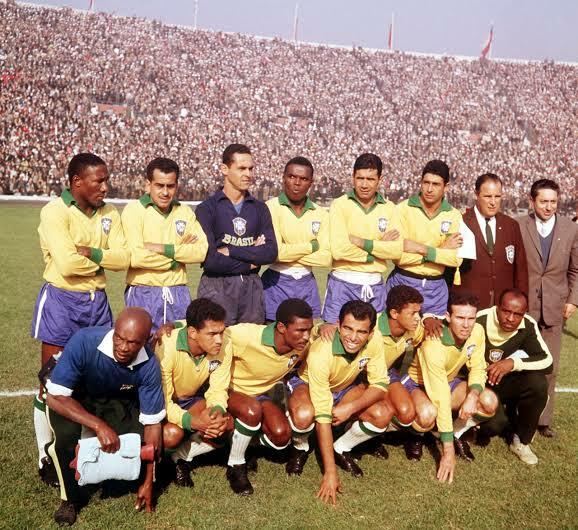 The match ended 3–1 to Brazil, a successful defence of the title for only the second time in the history of the competition in spite of the absence of one of their star players of 1958, Pelé, who was replaced by Amarildo. 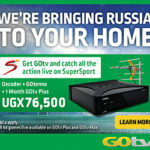 Six players led the way in terms of scoring (4 each) and they included Brazilian duo of Vava, Garrincha, Chile’s Leonel Sanchez, Hungary’s Florian Albert, Valentin Ivanov of Soviet Union and Drazan Jerkovic of Yugoslavia.